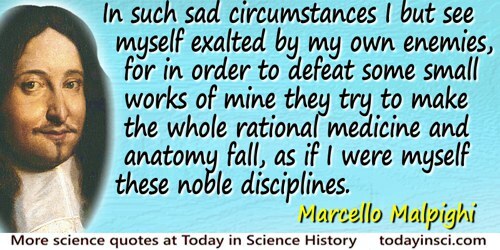 In such sad circumstances I but see myself exalted by my own enemies, for in order to defeat some small works of mine they try to make the whole rational medicine and anatomy fall, as if I were myself these noble disciplines. 'Letter to Marescotti about the dispute with Sbaraglia and others, 1689(? )', in H. B. Adelmann (ed. ), The Correspondence of Marcello Malpighi (1975), Vol. 4, 1561.